304 pages | 1 B/W Illus. The boundary between Cuba and the United States has become more and more porous, as have those with Latin America and the Caribbean. Never in the past half-century has Cuba’s leadership or its social and political fabric been so exposed to the influence of the outside world. 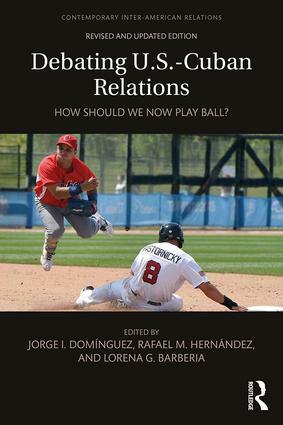 In this book, an all-star cast of experts critically address the recent past and present in U.S.-Cuban relations in their full complexity and subtlety to develop a perspective on the evolution of the conflict and an inventory of forms of cooperation. This much needed approach provides a way to answer the questions "what has been . . .?" and "what is . . .?" while also thinking seriously about "what if . . .?" To illustrate the most significant areas of U.S.-Cuban relations in the contemporary era, this newly updated edition of Debating U.S.-Cuban Relations adds six more themes to the study of this complex relation: political, security, economic, and cultural/academic issues; the triangular relations of the United States, Cuba, and Europe; and the politics of Cuban migration/emigration. Each topic is represented by perspectives from both Cuban and non-Cuban scholars, leading to a resource rich in insight and a model of transnational dialogue. The future course of U.S.-Cuban relations will likely be more complex than in the past, not only because of the matrix of factors involved but also because of the number of actors. Such a multiplicity of domestic, regional, and global factors is unique; it includes the rise to power of new administrations in both countries since 2008. Raúl Castro became president of Cuba in February 2008 and Barack Obama was inaugurated president of the United States in January 2009. And it will feature the inauguration of a new president of the United States in January 2017 and a new president of Cuba, likely in February 2018. Chapter 4: Cuba’s National Security vis-à-vis the United States: Conflict or Cooperation? Are We? Where Might We Be Able to Go? Jorge I. Domínguez is the Antonio Madero Professor for the Study of Mexico and former Vice Provost for International Affairs at Harvard University. He is a past President of the Latin American Studies Association. Rafael M. Hernández is the Chief Editor of Temas, Cuba’s leading magazine in the social sciences. He has been Professor at the University of Havana; Director of U.S. studies at the Centro de Estudios sobre América; and a Senior Research Fellow at the Instituto "Juan Marinello" in Havana (1996–2008). He has published on Cuban and U.S. policies, inter-American relations, international security, migration, and Cuban culture, civil society, and politics. Lorena G. Barberia is an Associate Professor in the Department of Political Science at the University of São Paulo, Brazil. Her primary research and teaching interests are political economy, comparative politics, and political methodology. Much of her recent work is aimed at analyzing redistributive politics in Latin America. This series provides an overview of current U.S.-Latin American bilateral relations, covering political, economic, and security topics, as well as discussion of drug trafficking and international migration. The impact of democratization, increased economic openness, and the changed security environment after the Cold War in the region are explored in each volume, all the while engaging with each country’s particular history, resource endowment, institutional features, and leadership characteristics.